An early birthday present arrived this week in the form of a Proxxon Micromot 50EF drilling and milling machine and associated power pack. 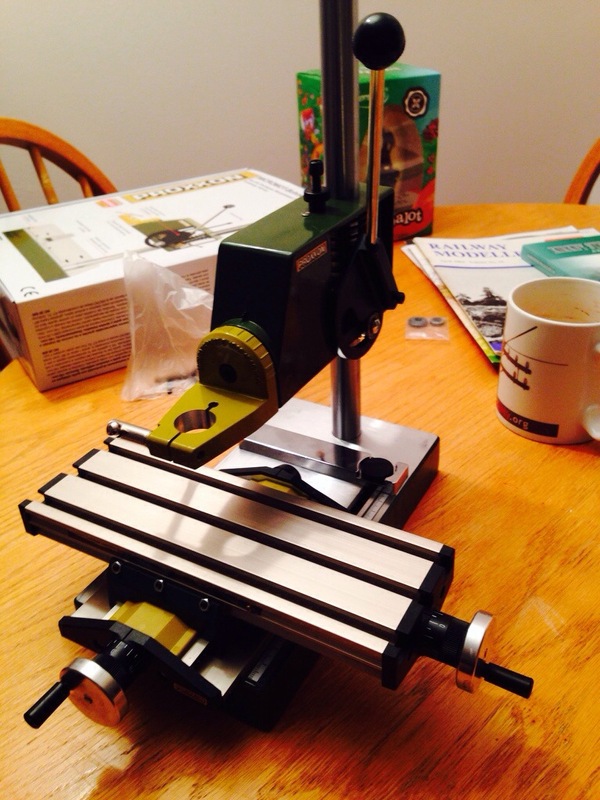 It’s been augmented by this MB140 drill press and KT70 compound table. Used freehand last night with a milling tool, the drill made modifying a couple of Bachmann wagon chassis for EM wheelsets an absolute dawdle. Attached to the press and table shown here, it will perform similar wonders when it comes to opening out channels in cast axleboxes, allowing free movement of the bearings when using sprung systems such as Bill Bedford’s. It will also make much more accurate drilling possible where opening up holes boiler mounts is required for example. I never got the opportunity to learn the skills of the engineer, but I’m sure I can make up for that a little by learning the correct use of this equipment. Looks impressive! Also looks like you are a bit behind with your Modeller reading! Aye, John. That one was an early birthday present too; from the month of my birth! Just waiting for the 2mm mill tool to arrive so I can slot the axleboxes on my sprung plate wagon.